School Daze (1988) movie poster, September 17, 2012. (QuasyBoy via Wikipedia). Qualifies as fair use under US Copyright laws, as depicts subject of blog, is scaled-down and is of low-resolution. 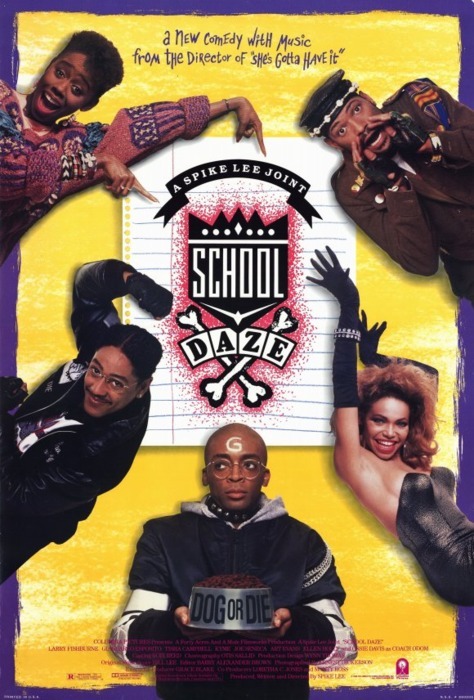 One of the few films I saw soon after it came out in theaters during my Boy @ The Window years was School Daze. It was in fact on this date twenty-five years ago that I went to the old theater in Pittsburgh that once was on Forbes Avenue near the Oakland Primanti Bros. sandwich place to see the film. It gave me some serious food for thought that Spring Break Friday evening, so much so that the lessons of School Daze have stayed with me to this day. Considering that I turned down a date with an upperclassman not interested in seeing the film in the process, School Daze was more than worth it. The biggest lesson for me was on colorism. Not the macabre hazing of Q-dog frat boys and the cliquish AKA and Delta soros. Not the lack of care for the academic or the step-show battles. Not the hedonist behavior of Black middle class Gen Xers hell-bent on doing everything other than graduating from college. I already knew students like this at Pitt. Really, I already knew former classmates from Mount Vernon High School who attended HBCU’s like Howard, Morehouse, Hampton and Spelman, the kind of people who’d be perfect candidates for this Spike Lee joint. That they would psychologically and physically abuse each other in bed and on campus didn’t surprise me in the least. “Good and Bad Hair” scene, School Daze (1988), March 10, 2013. (Donald Earl Collins via YouTube). Qualifies as fair use (see previous picture). I certainly saw it with my father Jimme, who threw around the word “redbone” in my last year of high school as if the only young women in my NYC-area universe were light, bright and almost White. But I also saw it in the cliquishness and popularity of some of my classmates and other MVHS attendees and alumni. The most prominent of them at the time was Albert Brown, aka, Al B. Sure. Despite the uni-brow and limited talent, he went a long way in terms of popularity with his Class of ’86 and in the years immediately after high school. But there were others, classmates with bit-role appearances on ABC’s All My Children, folks whose entire circle of so-called close friends met some internalized color line. It’s safe to say that by the time I left the theater — about 9 pm that Friday — I was actually angry. 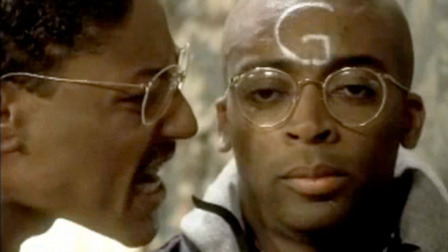 I wanted to take Giancarlo Esposito behind a building and beat him into another world. But more than that, it put some of the issues I had with high school and my first year at the University of Pittsburgh in perspective. Obvious and subtle forms of bigotry, individual racism and institutional/structural racism are all things I expected to face. This internalized bigotry on the basis of skin color, though, explained some of the shunning that I’d faced in my last couple of years of high school (see my post “The Silent Treatment” from June ’11) especially. Hazing scene from School Daze (1988), March 10, 2013. (http://tumbler.com). Qualifies as fair use (see previous picture). Yeah, I was weird because I was in a weird place in terms of domestic violence, child abuse and welfare poverty in those years. I didn’t help matters by being down with Tears for Fears and Sting and Mr. Mister and by often walking at Warp Factor Three or higher to cover the twenty-acre school between classes. But being poor and looking poor and a darker shade of brown was the first thing the Rick James-Eddie Murphy “Party All The Time” set saw, even before I turned into a blur walking past them every day. A few years after School Daze, I went to David Lawrence Hall to watch the Pitt Film Club’s showing of Mo’ Better Blues (1990) with Denzel Washington and Wesley Snipes. A decidedly light-skinned underclassman (who was in my easy-A Intro to Black Studies course – I was a senior at Pitt by this time) – let’s call her ‘R’ – saw me and decided to sit with me to watch the film. Every time Wesley Snipes was on the screen, she commented on how dark he was. Making me uncomfortable, to say the least.